Post utme score stands as the number one factor for unilorin admission. So I am going to teach you how to score high in unilorin post utme. Anyone who reads and acts accordingly will definitely pass Unilorin post utme. I think unilorin post utme stands as a huge barricade blocking students from admission. So many aspirants struggle every year to secure admission into the University of Ilorin, but Unilorin post utme always causes a blockage. Clearly, Unilorin Post Utme is one of the hardest exams you did write! Oops! Did I just say that? Yes, I did, so you remember you have an elephant to chew. But we have seen students scoring 70% above, so much so I am going to show you those tricks that they used to score high in Unilorin post Utme. Have you been writing Unilorin Post Utme, but your score is always not impressive. Or you are about to write Unilorin Post Utme? I'm going to share with you the best tips to score as high as 70+ in Unilorin Post Utme 2019, guaranteed, if you follow this guide. HOW TO SCORE HIGH IN UNILORIN POST UTME. To pass Unilorin post utme 2019 by scoring very high, you need to follow these steps. STEP 1: Understand the structure of the Exam. Among the number of candidates of over 11,000 students who sit for Unilorin Post Utme 2018, only 20% of them scored high in, I mean above 70℅. If you want to score high in Unilorin post utme, you need to study the structure. STEP 2: Prepare in Excess far before the exam begins. Overdone is better than Underdone. To pass Unilorin post utme, you ought to prepare blue and black. There's nothing like too much preparation, to dull the sharp edge of a man's honor. There are tons of mass failure in Unilorin Post Utme screening test simply because most students think it is a casual exam and mare preparation is enough. Unless you prepare, you can't excel. STEP 3: Know the reason behind While an average number of students fail. Painstakingly take the time to examine the reasons others fail, you can use it as a stepping stone for yourself. But the issue is, who cares about others failure? Well, you need to, because humans learn from mistakes. STEP 4: Avoid Cheating Practices and Use the Exam strategy I teach students. You have seen so many exam boards where malpractice is frequent. But the bad news is, such doesn't exist in Unilorin post utme. And the good news is, I am going to teach you a powerful strategy to use during the exam. If you follow these steps you will definitely score high in Unilorin post Utme. It is the formula all the students who passed Unilorin post utme leveraged. I always draw out this point. See: " Unilorin 2019 Post Utme Cut off mark for of various courses"
Been obvious according to my guide on How to get Admission into Unilorin 2019 "The higher you score in Post Utme, The higher your admission chances get, the less you score the fewer chances your admission will be." Unilorin Admission system is like 300 people trying to enter a bus that will only contain 100 people. Only those who struggle will enter, no matter how lucky you are. You must struggle. Unilorin help mate team is on a mission to help a number of students score high in the coming Post Utme Exam so if you read and understand this you are certain of scoring High, and not less down 70%. Every exam has a structure and it pays if you know them. Unilorin post utme structure is simplistic. But they don't use the same pattern for every student. Remember, there is a total of 50 questions in Unilorin post utme. It is constituted of English language, Current affair, Mathematics, and general paper.Albeit, a student may have more of 'English language', while another may have more of mathematics. But 65 out of 100 students would see more of 'English language' This only means your study must be comprehensive and you mustn't ignore any of the subjects. Use these tips to prepare for Unilorin Post Utme. Get an Updated Unilorin post-utme past questions. Get Current affair and some necessary textbooks. Remember I talked about preparing in excess as a medium to score high in Unilorin post Utme. Does that mean you should read 24 hours a day? No, that would be counterproductive. If you're preparing for a marathon race, do you expect the runner to run 24 hours a day or whatever the case may be? That's not the meaning of the excess reading I suggested to pass Unilorin post utme. Excess preparation has to deal with doing all that has to involve preparation, and the above tips should help. As a student, the reason you fail Unilorin Post Utme are as follows. You believe you can't pass Unilorin post utme. You don't know how to answer question fast in CBT. You don't know English language. These are the Five reasons that make a normal number of students not to score high in Unilorin post utme. If you keep telling yourself Unilorin Post Utme is difficult or you believe those who tell you, you will keep believing you can't pass it. Even if it is hard; that doesn't imply that you cannot make it. It is the same exam thousands of students who are already in school wrote? Its rather not possible that they are all very intelligent, or smarter than you are. So stop believing you cannot pass Unilorin Post Utme. Effective use of time will make you score high. Unilorin Post Utme is simple if you understand the structure. I have given you an exact structure above. This is the major reason for failure in Unilorin Post Utme. The time given to answer 50 questions is just 30 or 20 minutes. It won't be funny if before you reach number ten, and the exam ends. Hahaha! Thanks for scoring 20℅ see you in the next Post Utme. Well is there a trick to score high in Unilorin Post Utme 2019, by answering all questions before the time runs out? This is the same thing that happens in Jamb, Nigerians are used to speaking English that is old an no longer correct and they as well put it into writing; thereby finding it difficult to pass 'English language' exam. More so, 'English' is inevitable in Unilorin Post Utme. You have to be good in it, that is where the majority of the questions will come from. However, Unilorin English language is the most technical of them all. In Unilorin English, somearial the answers that look useless the most is the right one. These are some Unilorin post utme 'English language' past questions. Check the form they take. What do you think is the answer. I know you think it's "B"
The correct "Answer is A"
In a formal letter salutation simply means "Dear Sir/Ma'am" or "Dear... Follow by the person's name. " I know you just chose The wrong answer. What is a letter of complaint? Well "A" is the correct answer. The first time I saw this question, I was just thinking for almost 3 minutes. Is it "B" Or "D"
Better still I think it "B"
That's how you waste your time and if you answer without calculating you may end up scoring "Sweet zero"
Let's take this last one! 4. As as a system of communication, a given language has its own sets of _____________. No need to go waste your time if you don't prepare adequately. If you fail to prepare You are preparing to fail. I made 72% during my time, I can't tell you it was easy or difficult but am sure you can't get close if you don't prepare as if you are writing an exam that will take you to heaven. You did not study the right past questions. There are bulks of Unilorin Past questions that are fake, and most of them, You will find people still selling it. Why won't you fail, if you don't study the right materials? So these are the major reasons for failures. How does Unilorin Post Utme Looks Like? Unilorin post utme is a CBT test The questions will be 50 in number. You will only have 30 minutes. ￼ > English Language, Mathematics, General paper, and Current Affairs. By and large, Unilorin doesn't have an extent in which the questions are provided to applicants. This implies that a student may have his or her own subjects ie The ratio of 40:30:20:10 i.e Eng Lang.= 40, Mathematics=30, General Question=20, Current Affairs=10￼ while another candidate will have his/her blend in the proportion 50:10:30:10, etc So, therefore, every student has his own format, yet one thing is sure, you will be given 50 questions altogether. So if you are preparing, prepare fully. How to Pass Unilorin Post Utme 2019 Now let's get down to business. Below is our concluding part of this article. The goal is to score high and pass Unilorin post utme. Conclusively, you know your mistakes and you have learned some things above. The following two steps will lead you into getting a high score in Unilorin post-Utme 2019. So let's get down on it. So let's see what we have here. STEP 1: Always Test Your Capabilities. How good are, that is the where we start lacing a solution. First I need to ask a question. Are you ready for Unilorin 2019 Post Utme, if you are let's get started? Don't forget to Bookmark this Site if you need to revise all these. STEP 2: Enroll for Our Advanced Unilorin Preparation Advanced Unilorin Post Utme 2019 Preparation. The advanced preparation is a more powerful solution for any student to pass Unilorin post utme. It's an online practical step. Stay tuned to be part if it. STEP 3: Join Our Unilorin Post Utme WhatsApp Group. Unilorin Post Utme WhatsApp group 2019 To join Unilorin post utme WhatsApp group: Message 08088698450 You will be added at no cost. The group will surround you with other individuals writing the exam also. STEP 4: You need to Know every single detail about Unilorin Post Utme. Always remember, information is power. 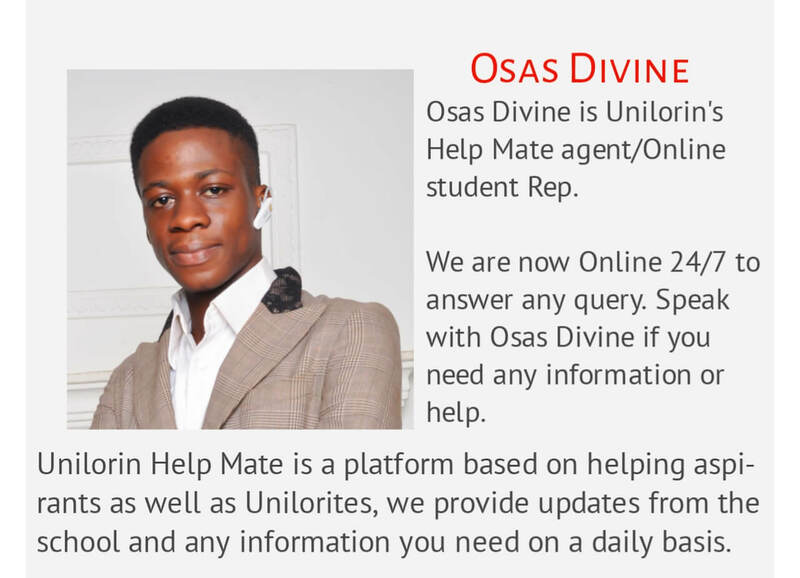 Se eSeery Detail you need Concerning Unilorin post utme If you have any questions leave a comment below. All the best!